Discovered on 19 October, the object's speed and trajectory strongly suggested it originated in a planetary system around another star. Astronomers have been scrambling to observe the unique space rock, known as 'Oumuamua, before it fades from view. These changes in brightness were the clue to 'Oumuamua's bizarre shape. "Looking at the asteroid light curve database, there are five objects (out of 20,000) that have light curves that would suggest a shape up to an axis ratio of about 7-8 to 1," Dr. Meech told BBC News. "Our errors are very small, so we are confident this is really elongated. Also, one has to realize we don't know where the rotation pole is pointed. We assumed that it was perpendicular to the line of sight. If it were tipped over at all, then there are projection effects and the 10:1 is a minimum. It could be more elongated!" 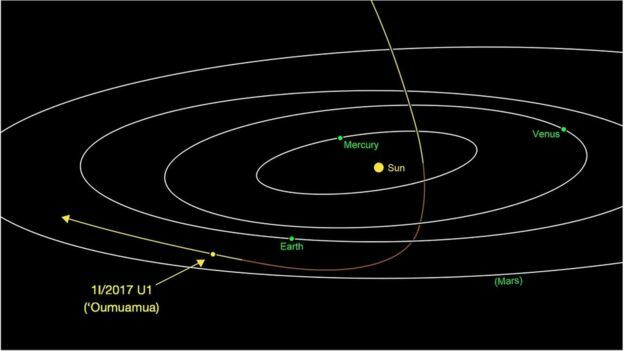 But in other respects, 'Oumuamua (pronounced oh MOO-uh MOO-uh), appears to resemble objects we know from closer to home. "We also found that it had a reddish colour, similar to objects in the outer Solar System, and confirmed that it is completely inert, without the faintest hint of dust around it," Dr Meech said. These properties suggest that 'Oumuamua is dense, comprised of rock and possibly metals, has no water or ice, and that its surface was reddened due to the effects of irradiation from cosmic rays over long periods of time. 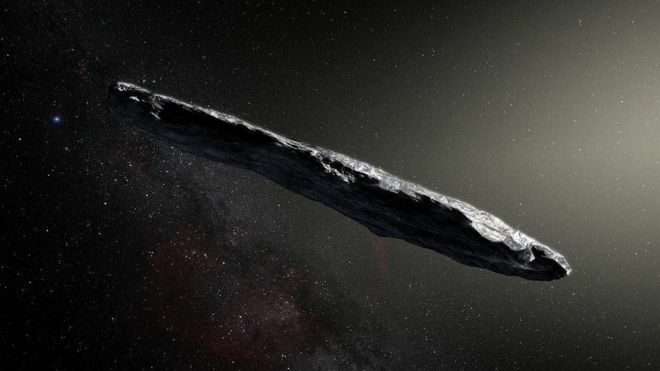 "For decades we've theorized that such interstellar objects are out there, and now - for the first time - we have direct evidence they exist," said Thomas Zurbuchen, associate administrator for Nasa's science mission directorate in Washington DC. "This history-making discovery is opening a new window to study the formation of solar systems beyond our own." As regards how 'Oumuamua became so elongated, Dr Meech explained: "There has been speculation among various team members about this. Sometimes very elongated objects are contact binaries... but even so, the pieces would be longer than most things in the Solar System, and our analysis shows that it is rotating fast enough that they should not stay together. "One of our team wondered if, during a planetary system formation, if there was a large collision between bodies that had molten cores, some material could get ejected out and then freeze in an elongated shape. "Another team member was wondering if there could be some process during the ejection - say if there was a nearby supernova explosion that could be responsible."